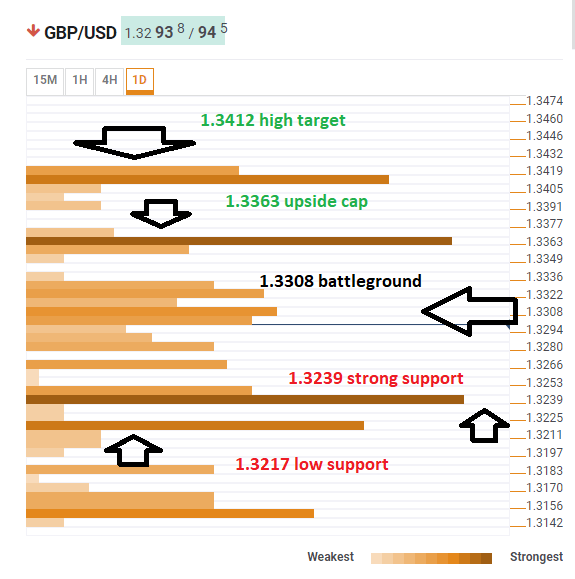 GBP/USD is off the highs above 1.3300 but still holding onto high ground close to the number as optimism about a delay of Brexit prevails. What’s next? The Technical Confluences Indicator shows that cable battles a dense cluster of levels around 1.3308 where we see the Simple Moving Average 5-15m, the SMA 10-15m, the SMA 100-15m, the Bollinger Band 15min-Middle, the Fibonacci 38.2% one-day, and the SMA 50-15m. Significant resistance awaits at 1.3363 where we see the meeting point of the Pivot Point one-day Resistance 1, the PP 1w-R3, and the previous daily high. The next upside target is 1.3412 which is the confluence of the PP 1m-R1, the PP 1d-R2. Looking down, significant support awaits at 1.3239 where we see the convergence of the previous day’s low, the PP 1w-R2, and the PP 1d-S1. The next support line is very close, at 1.3217 where we see the previous month’s high, and the BB 4h-Middle.